The anime channel's fourth simulcast title premieres on April 9, within an hour after Japanese telecast. Southeast Asian anime channel ANIPLUS Asia has announced on Thursday that the upcoming sci-fi anime series RobiHachi will be their fourth simulcast title this Spring 2019 season. The upcoming anime will premiere on April 9, which airs every Mondays at 12:00am (Philippine Standard Time), within an hour after its initial Japanese telecast. Encore telecast on Tuesday nights at 11:00pm. The upcoming series will be in addition to previously announced simulcast airings of AFTERLOST, Isekai Quartet, and the Second Part of Attack on Titan’s third season. The simulcast airing of The Rise of the Shield Hero will continue into the Spring season, which airs every Wednesday nights. © Taiga Umatani / Dontsu Inc. In NEOTOKYO in the year G.C.0051, humans have known of aliens for the last 50 years and obtained super light-speed navigation technology and formed a commonwealth of planets. Self-proclaimed freelance reporter Robby Yarge loses his job, his girlfriend, and almost his life. Debt collectors are after him. One day, Robby gets robbed and a young man helps him. He turns out to be Hatchi Kita, an 18-year-old debt collector, working for the loan shark Yang. A cat-and-mouse chase begins, and Yang takes his subordinates Allo and Gras along for the ride. 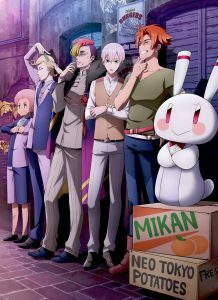 RobiHachi is an upcoming anime series produced by Studio Comet, which will be directed by Shinji Takamatsu, who recently worked in the popular comedy anime Grand Blue. The Disastrous Life of Saiki K. scriptwriter Hiroko Kanasugi will handle the upcoming anime’s series composition, and Yuuko Yahiro, who recently worked on the popular romantic comedy anime Kaguya-sama: Love is War, will handle the character designs. The Japanese voice cast will be lead by Kazuya Nagai (“Roronoa Zoro”, One Piece) as “Robby Yarge” and Keisuke Kumoto (“Kagura Karatachi”, Boruto: Naruto Next Generations) as “Hatchi Kita”.